In the last couple of weeks, I've noticed a new trend in brand video content. Well, at least for two brands. Last week, Ray Ban helped sponsor this video using optical illusions. I have no other way to describe it except that it messes with your head (in a fun way of course). Taking 2D objects and making them appear 3D just off of perspective is always cool. Almost as soon as I posted this video on my Tumblr blog, Honda plays a "one up" game and releases this commercial. It's even trippier than the Ray Ban video. 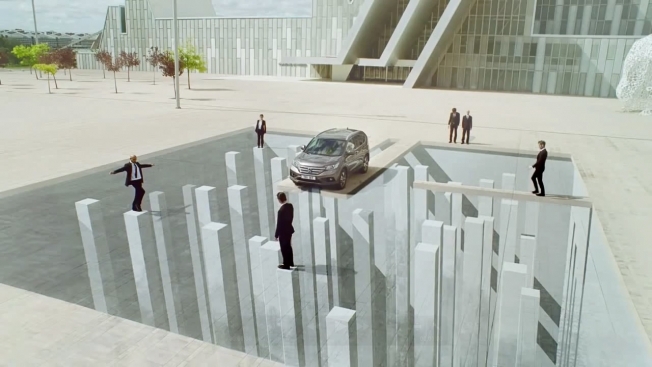 If I didn't know any better, I would say mind-bending ads are the new trend in online video. I must say, it is engaging. Showing an ad that messes with your head and makes you wonder "how did they do that?" keeps you on the page and less likely to click away to something different after five seconds. What cool ads have you all seen out there lately? Side note: if you like to see random videos, quotes or other bits of "just for fun" musings, check out my Tumblr page. It's my miscellaneous space for fun random content.